I realize I’m not the only design enthusiast that remembers Robert Denning & Vincent Fourcade‘s maximalist approach to decoration. I loved the excess of their interiors and I was certainly not their only fan. By now, you’ve likely seen Penelope Green’s New York Times article on the show house or the first of my friend Stacey Bewkes’ stories on her blog (more to come so check back). What’s exciting about digital media is that we’re exposed to so many perspectives. My take? I was struck by the enthusiasm the designers participating this year had in embracing their rooms. Pattern-on-pattern seems to be the trend, a welcome indulgence/distraction from our politicized climate. Billy Cotton’s bedroom is a case in point. His muse? An elderly woman, down on her luck, and living in a single room decorated by a loyal gay friend who has arranged the bits and pieces of her life. Custom nicotine-colored Fromental wallpaper flecked with gold, a historical document chintz from Pierre Frey, and cheetah carpeting all meld to create the tableau. And as it so happens there’s another eccentric gal in residence this year at Kips Bay: Ken Fulk’s hostess and garden lover, set to serve dinner for 8 at the crossroads of the Central Park Zoo and the Brooklyn Botanical Gardens. The fresh flowers in the room on my visit rivaled those in the Metropolitan Museum of Art’s Great Hall provided by the endowment of the late Lila Acheson Wallace. Excess at its theatrical best. Every year there’s the ‘short straw’ at Kips Bay — the awkward room that presents a seemingly impossible challenge for the designers assigned the space. This year it fell to Timothy Brown. Brown rose to the occasion on the top floor landing by sheathing the walls, moldings, and doors in a custom colored Adelphi Wallpaper. The effect made me think of Madeline Kahn in High Anxiety with her Cadillac, jumpsuit, and purse all in matching Louis Vuitton print: Proof that at their best ‘ridiculous’ and ‘genius’ are synonymous. Brown’s muse, a mid-forties French lesbian who inherited the house (as well as the silk velvet covered Italian settee) from her aunt, makes her way to the lower levels by traversing jewel-toned shards of carpeting which radiate from the space and down the stairs. Other highlights in the house? Freshman Nick Olsen’s sitting room; Joan Dineen’s pitch-perfect bedroom; and Joan Craig’s brass-outlined basement bar. 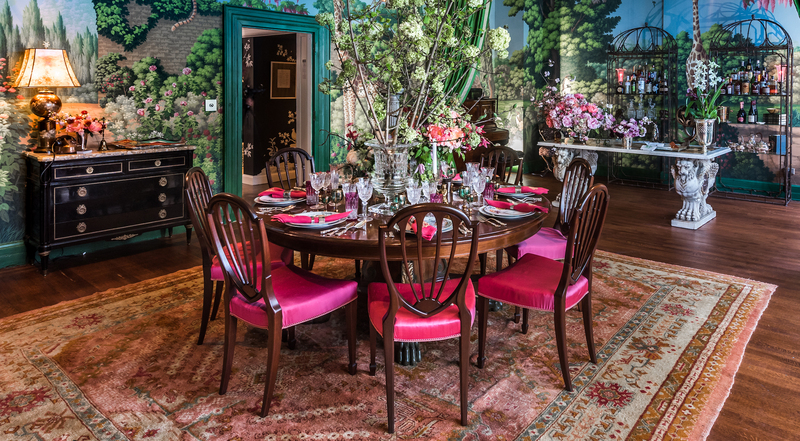 With the proceeds of ticket sales going to the Kips Bay Boys and Girls Club, a visit to the showhouse is good for the soul and good for the senses. Make a plan and go. Thanks for the mention Carl! Great house and never enough time to write about all the rooms!